Make sure you have Node.js v4.0 or above installed on your machine. There are some known issues to installing the above packages. To resolve these issues, run npm install --global --production windows-build-tools using a command prompt in Run as administrator mode, run SET VCTargetsPath=C:\Program Files (x86)\MSBuild\Microsoft.Cpp\v4.0\V140 after replacing the path with your installed version, and then rerun the above installation commands. 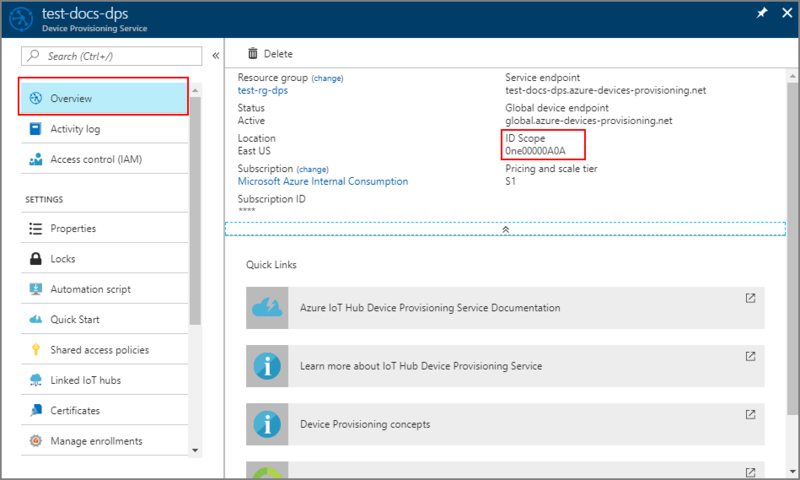 The samples below use the azure-iot-provisioning-device-http and azure-iot-device-mqtt transports. Using a text editor, create a new ExtractDevice.js file in the registerdevice folder. The output window displays the Endorsement Key and the Registration ID needed for device enrollment. Note down these values. 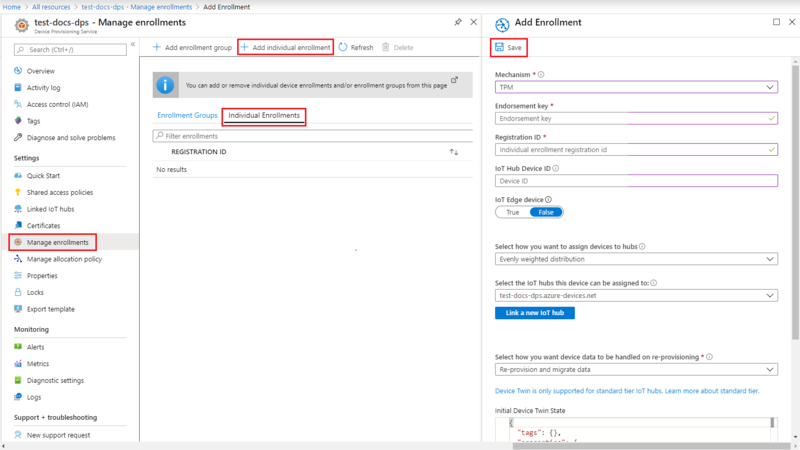 In the Azure portal, select the Overview blade for your Device Provisioning service and note down the Global Device Endpoint and ID Scope values. Using a text editor, create a new RegisterDevice.js file in the registerdevice folder. 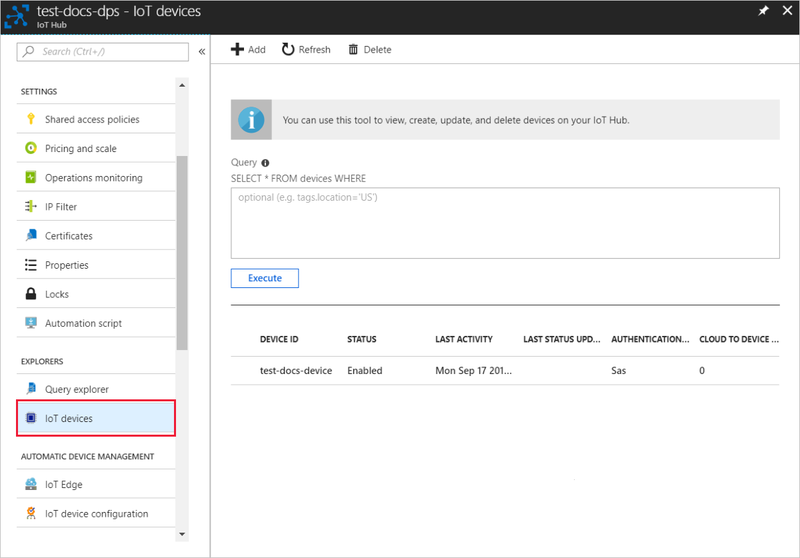 The Azure IoT SDK for Node.js supports additional protocols like AMQP, AMQP WS, and MQTT WS. For more examples, see Device Provisioning Service SDK for Node.js samples. Notice the messages that simulate the device booting and connecting to the Device Provisioning Service to get your IoT hub information. On successful provisioning of your simulated device to the IoT hub linked with your provisioning service, the device ID appears on the hub's IoT Devices blade.